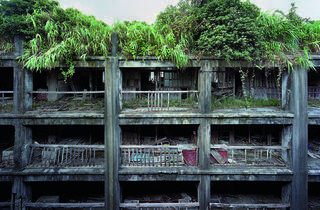 After photographing the ruins of Detroit, then criss-crossing the USA in search of traces of run-down 1930s movie theatres, Yves Marchand (born in 1981) and Romain Meffre (born in 1987) chose the ruins of the phantom island of Hashima in Japan, a mass of abandoned concrete just off Nagasaki. 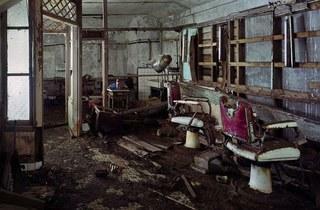 They came back with tattered landscapes and shots of disembowelled interiors. 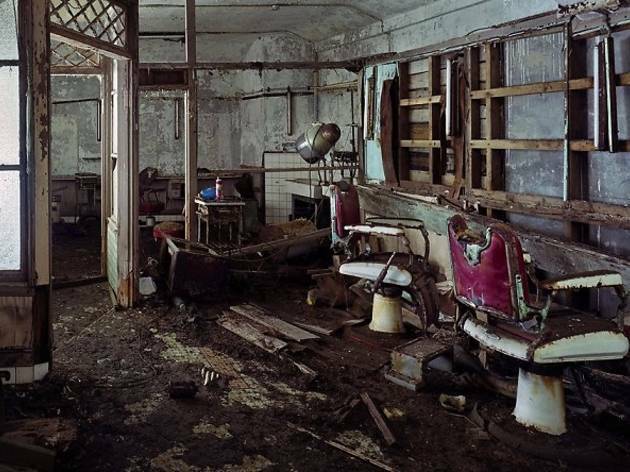 The images are due out in book form from Steidl in June 2013, but while you wait, there are a dozen photos on display at the Polka gallery, from a series that documents the changes of post-industrial decline. The place known as Gunkanjima (‘the vessel of war’) was inhabited, for a great part of the 20th century, by Mitsubishi miners. It chewed up and spat out enormous quantities of charcoal, participated in the war effort and contributed to the Japanese economic boom. At its apogee in 1959, the island hosted a cinema, schools, bars, a hospital and shops – with more than 5,000 inhabitants, the world had never seen anywhere so densely populated. Its cold, brutal buildings (one of them housed the villain in the James Bond film ‘Skyfall’) embodied the spirit of the age: depersonalised, collective, brutal, rational, devoted to production and the company. But, of course, it didn’t last. Oil replaced charcoal, the mine closed in 1974 and the concrete pile was swiftly deserted. 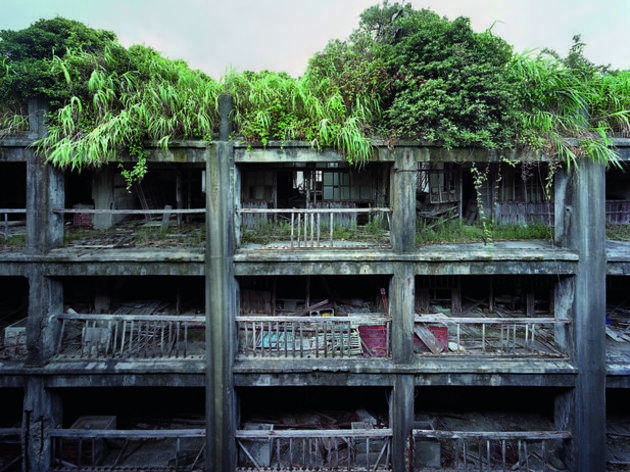 Today, there’s nothing left of Hashima but the carcass of a manufacturing empire, eroded by the sea air. 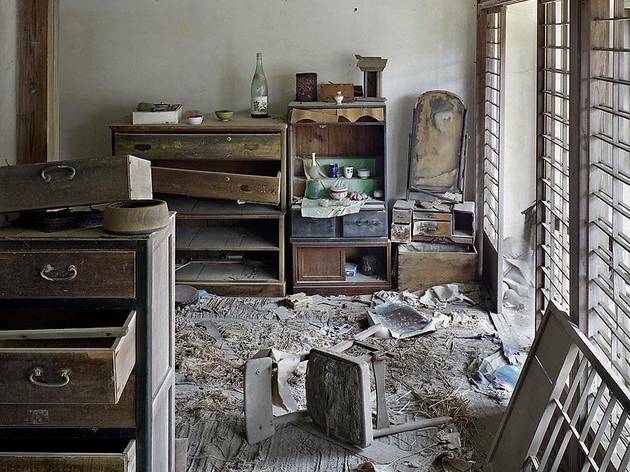 Just a few destroyed houses, mattresses, plastic bottles and wrecked TV aerials still maintain a link with the past. 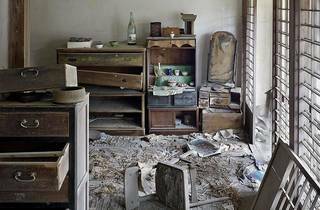 It’s a dream destination for two photographers who, like forensic pathologists, map the scars of worlds that have passed and that are rotting away.